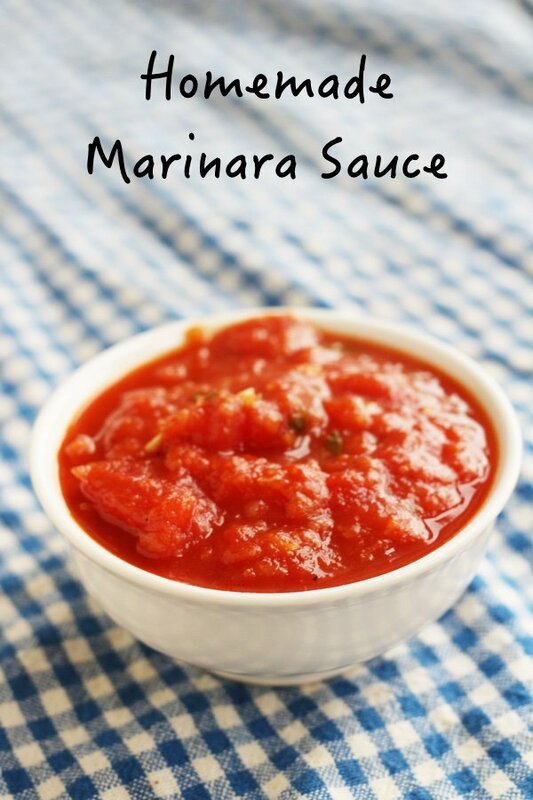 Do you know how to make homemade marinara sauce in 20 minutes? It is pretty easy but it does involve mincing garlic. 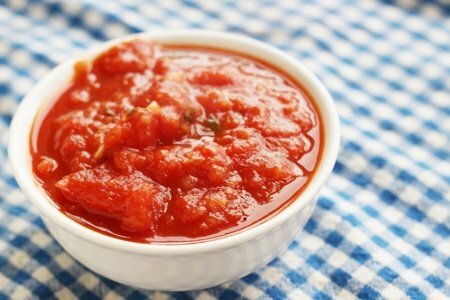 I have written about purchasing jarred tomato sauce – low sugar tomato sauce and best and worst pasta sauce. Honestly, if you can make your own you are going to be able to cut the sugar to almost nothing and have a fresher and more delicious product. This is a great addition to your "no sugar added" recipes that are far better than anything you can buy. All the sugar in this recipe is due to the tomatoes. You can freeze this, serve it on eggs, mix it in your coffee - whatever! There are two important ingredients for this recipe that make it work. The first is San Marzano tomatoes. I know that these retail for $3 or more per can but they are so much better than regular canned tomatoes. Something about the soil of Mt. Vesuvius makes them taste very rich. I found these at Costco but they are usually at the bottom of the shelf in the grocery store. Give them a try and tell me if you think they are worth it. The other key ingredient is fresh basil. This time of year, I can buy a plant in the produce section of my store for $1.79. 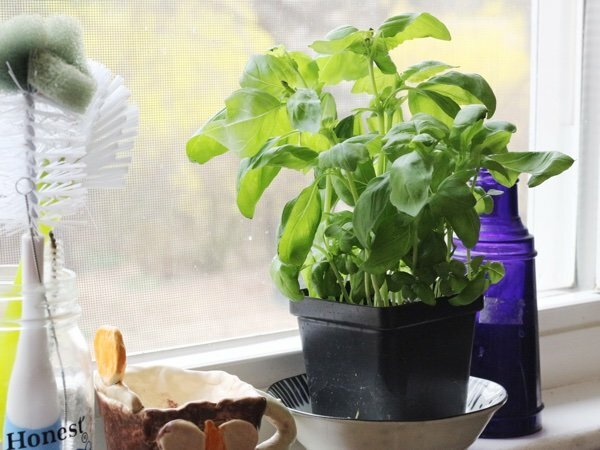 I keep this plant on my windowsill where I don’t forget to water it and add basil to all sorts of recipes throughout the summer until the plant dies. This is a very affordable way to use a great flavoring agent. This recipe asks you to grate an onion which can be painful (as I found out). Go ahead and break out your food processor so the people in your family won’t wonder if you watched Titanic again. Use the food processor to mince the garlic and you have a win-win. You can't really miss with this sauce. It will make your life easy. Trust me! Heat olive oil to medium in a large saucepan. Add onion, garlic, and red pepper and sauté until softened about 4 minutes. Add tomatoes, basil, bay leaf, and salt and pepper. Crush the tomatoes with the back of a wooden spoon. Cover the pot and simmer on low for 15 minutes. Serve immediately. Can be frozen and will store in the fridge for about a week. I cannot make a sauce[gravy] to save my life. Do you use fresh Bay leaves? I've only seen the dried ones that my mother taught me I need to remove before serving. If fresh, where do you find, and do you cut it up like Basil? Lisa! Your singing my song today :) Thass Amore! 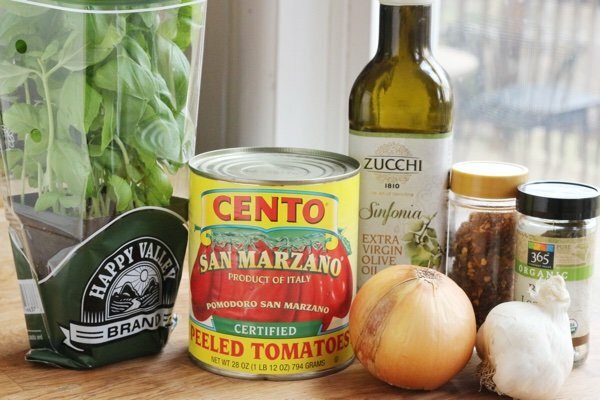 I use San Marzanos too, whole, which I blend myself, something about the ratio of tomato solids to juice is perfecto. 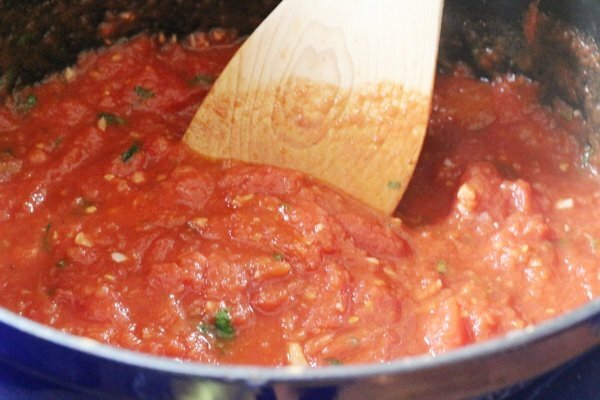 Most times I start with lots of minced garlic, extra virgin cold pressed olive oil, a healthy pinch of dried oregano, quickly rubbed in my palm to release the flavor, a shake of red pepper flakes, then at the sound and scent of the sizzle, dump in tomatoes with just enough water to rinse can and blender [about half cup]. Before long the greatest aroma known to man overtakes the senses and I start humming songs like ''Hey mambo, mambo italiano''! I'll often double it to freeze a pint or 2. I don't always add onion but when I do, I chop it myself not wanting to wash my food processor for uno onion. Ciao Bella! @Colleen -I used a dry bay leaf. I found them in the spice section. I did use fresh basil. Thanks for your question! 153 Cal.? Why So High? Delicious! I am not Italian and usually get the jarred stuff which is ok. I added two things: chopped mushrooms for flavor and a pinch of sugar. Would recommend this recipe to anyone. @RC - I made a bunch of mistakes on my calculation. Now it looks like the recipe is 66 calories for a cup of sauce. Thank you for pointing out my error! Can I used frozen chopped onions and minced garlic for the same flavor? I can hardly wait to try this! Thank you so much!! Cooks -- remove and discard the bay leaf before serving. When I purchase basil in a harvested clump, I trim the bottom of the bunch off by about 1/2 inch, then place it in water, like a bouquet of flowers. Change the water every day, and the herb could last two weeks or more. This is a terrific recipe full of Vit. A, lutein and zeaxanthin which is critical in protecting eyesight from macular degeneration and blindness. All the red fruits and veg have copious amounts of this protect. Do you really need the olive oil. I'm trying to go SOS (no salt oil or sugar) as much as possible. Yes, you need oil or other fats in your diet. Olive oil is one of the best. Fats are needed for the body to assimilate various vitamins and minerals. Fats in moderation do not make us fat, carbs do. I would lay off the pasta, rice and bread not this sauce or olive oil. You need it for hair, eyes, and weight loss, to prevent stroke, osteoporosis, and preventing skin cancer. The body benefits from good fats like olive oil. You also need some carbs for energy in your muscles. I recommend a balanced diet and talk with your doctor about nutrition. I use kidney beans often as they have less fat than some other beans. One thing worth cost is Dan Marzano tomatoes! I also use for homemade tomato soup. Similar recipe although I use immersive blender and add ff dairy to give it body and creaminess. I hv a little army of herb pots on my window sill. Be sure to report into a container slightly larger so they will thrive. I actually wintered oregano and thyme, a first. While foods had been sale last week so have myriad new plants. Happy spring from Boston!